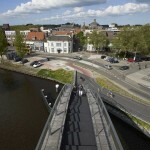 The Melkwegbridge (the Netherlands) crosses the Noordhollandsch Kanaal and connects the historic centre of Purmerend with the growing Weidevenne district in the south-west. 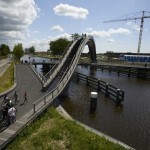 The bridge is the first stage in a masterplan for the canal and its periphery. 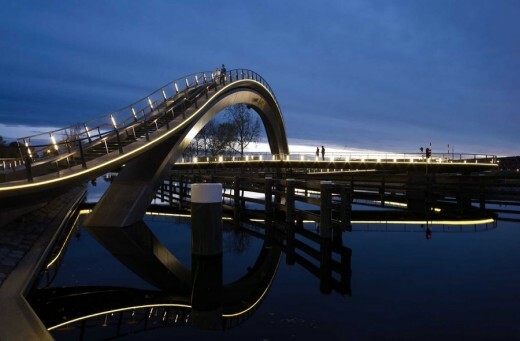 The most striking part of the bridge, designed by NEXT architects, is a massive arch which reaches a height of 12m above water level and stands in a continuous line with the Melkweg-road, thus offering an incredible view over the city. 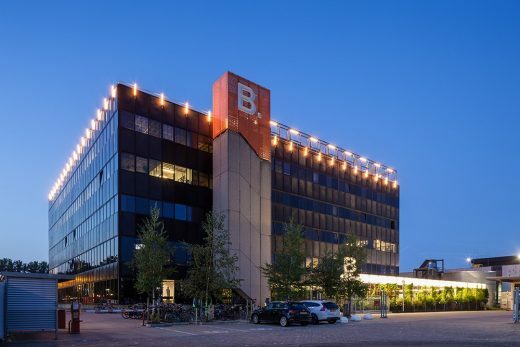 The high lookout gives pedestrians the opportunity to take a step back from their daily environment and, on a new level, experience the relation between the new and historic city of Purmerend. 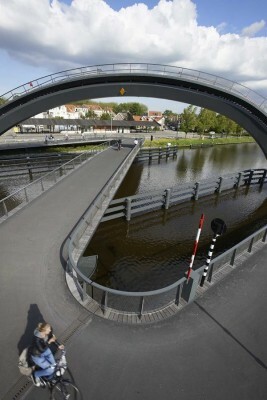 The lower bicycle deck is made out of a 100m long bicycle deck that crosses the water like a pendulum. The length of this deck was necessary due to the minimum slope conditions for bicycles and wheelchairs. Seperating cyclists from pedestrians, gave the opportunity to maintain the direct line of the historics Melkweg (Melkroad) within the bridge. 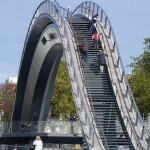 The pedestrian bridge weighs 85 tons, consists of 130 steps and is supported by a steel arch. The design makes it able to retain the spatial openness of the channel and its surroundings. 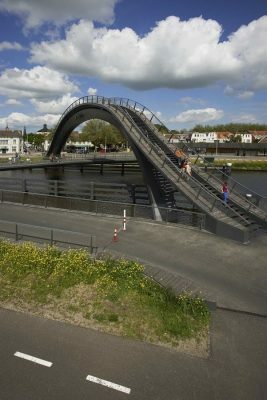 At 12 metres, this arch is high enough to allow boats to pass beneath; The lower deck splits into two parts that revolve open when boats are approaching. 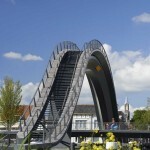 Both bridge sections flow smoothly into each other and form one whole. This unity is enhanced by the continuity of materials and colors. 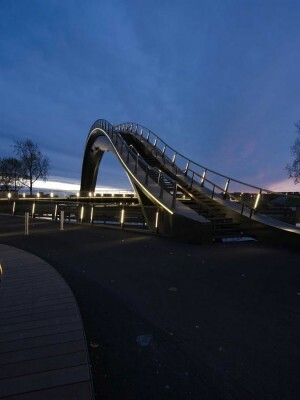 In the edges of the bridge LED lines are applied that follow the contour of the bridge and guarantees a spectacular view on the bridge even after sunset.